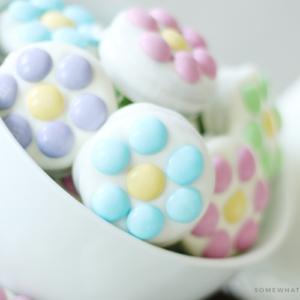 Chocolate covered oreo flowers are easy to make and the perfect way to get in the mood for Spring! Melt almond bark/chocolate according to package directions. Drop Oreos, one at a time, into the melted chocolate. Using a fork, lift the coated cookie out of the bark and gently tap the fork against the edge of the bowl a few time to remove excess bark. Slide cookie onto the lined baking sheet. While the bark is still soft, arrange M&M's to look like a flower. Let the chocolate harden, and enjoy!